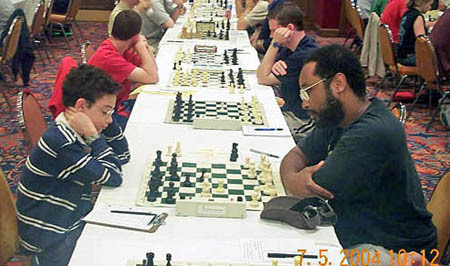 Kimani Stancil (right) playing (now GM) Fabiano Caruana at the 2004 World Open (Stancil won). Photo by Daaim Shabazz. Dr. Kimani A. Stancil has always had a keen mind. Having been raised in a self-affirming Afrocentric environment, he was always taught to believe in his own abilities. Having earned his Ph.D. in physics from M.I.T., Stancil was pegged as a rising star out of Maryland (USA) and participated in the Arnold Denker while in high school. Today he is a professional researcher in the area nanoscience in Berkeley, California. Apart from being a new husband, newer father and maintaining a rigorous research schedule, Stancil has found "free" time to participate in the Bay area chess scene. "Most notably, my participation has been in chess events at the Mechanics Institute in Downtown San Francisco, CA, and founding the MAAT Science Village Chess Club at the Museum of African American Technology (MAAT) Science Village in Downtown Oakland." The featured game took place at the Mechanics Institute has one of the oldest established chess clubs in the country. Stancil joins a long list of strong players in these tournaments. "It has a long and treasured history involving Tournaments with great players, high quality lectures by Grandmasters, and International Masters, a great chess library, and a clean environment for playing chess." Dr. Stancil added that the staff and tournament directors were cordial and knowledgeable and effective. IM John Donaldson is the Director of the famous club. In the following game, Dr. Stancil scores an impressive victory on his way to an amazing score of 8/8. His performance rating was USCF 2631 (based on all 8 players), and FIDE 2588 (based on 4 players). Kimani Stancil looks on while Maurice Ashley (standing left) makes point to R.O. Mitchell. 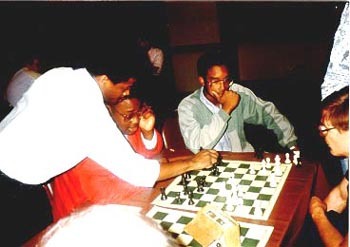 Both Stancil and Mitchell were competing in the Denker Tournament of Champions at the 1989 U.S. Open. Mitchell would later win the U.S. Junior Open in 1990, but would die tragically in 2007.